Review: Kevin Gorman's unstoppable edit craft continues! 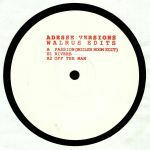 "Walrus Edits", as you may well have expected (or heard on his Boiler Room set) kicks off with a glittering twist on Barry White's "Passion". A lighter touched classic, here Gorman pays full respect with just a tweak in production to maintain the original's finesse. "Rivers" builds on AV's body of original work with creeping evocative piano licks while "Off The Man" continues the walrus theme with a dubbed out, highly strung take on "Somebody's Gonna Off The Man". Lovely.